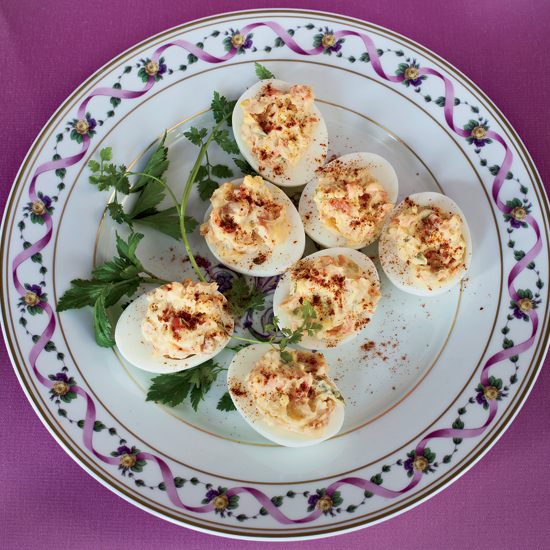 Deviled eggs are the perfect play food for chefs, as there are endless ways to vary them. Here are six ways to make this favorite party snack seriously spectacular. Laced with smoked paprika, Ashley Christensen’s deviled eggs are perfect for a barbecue. French chef Jean-Louis Palladin turned his deviled eggs into a mini meal by adding diced cooked shrimp, radishes and capers. Not only does Boston chef Joanne Chang spike her filling with wasabi and Sriracha, she also marinates the hard-boiled eggs in a sweet-spiced soy sauce before she devils them. Mash up two Southern classics, just like Bobby Flay, topping your deviled eggs with quick-pickled shrimp. Diced smoked salmon is chef Michael Mina’s favorite way to dress up his deviled eggs. Atlanta chef Ford Fry garnishes his goat-cheese-filled deviled eggs with torn pieces of country ham or prosciutto.